Unlike traditional petrol outboards the SPIRIT1.0 is emissions free and much quieter. You can enjoy silent boating experience with the only noise you'll hear is the water sloshing around. 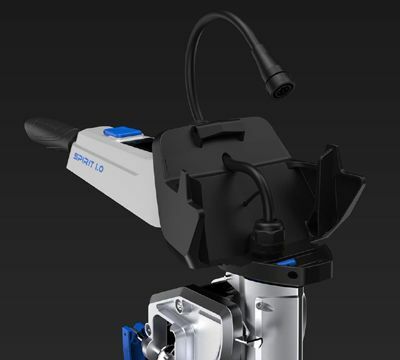 The SPIRIT 1.0 features a gearbox free design by mounting the motor directly into the bottom housing. This allows no loss of effeciency you'd recieve in a traditional outboard. The high quality brushless DC motor helps drive the maximum effciency. 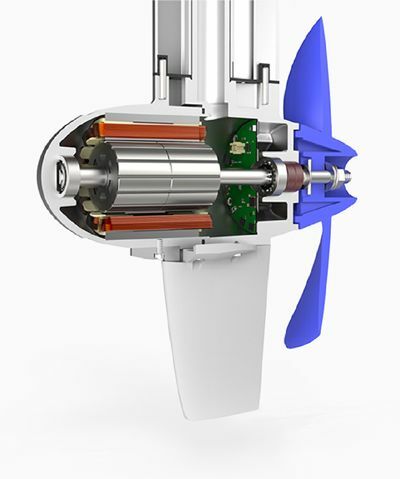 Other advantages of a gearless motor is greatly lower - even eliminate noise level. PLUS no servicing is needed. Saving you ongoing costs. The Battery is located on the top of the outboard. Which allows more space in your boat. As you dont have any fuel tanks or extenernal battery packs loading up your boat. The Battery's one handed release latch allows easy removal and battery replacement. The smart screen keeps you up todate with all the essential information you need to know during your trip. Real-Time voltage, power setting and most important of all the remaining batery power is displayed conviently on the screen. Only 2 steps are neede to install the battery. First place the battery on its base. The battery latch will automatically lock into place once alined. The plug the power cord into the battery socket and twist the collar to secure. This 3HP foldable electric outboard motor weighs only 16KG. Including the battery. This is the same weight as traditional 2-stroke outboards much lighter then the heavy 4-stroke outboards. It's designed to be portable so you can carry the motor in 1 hand and the batteryb in the other. 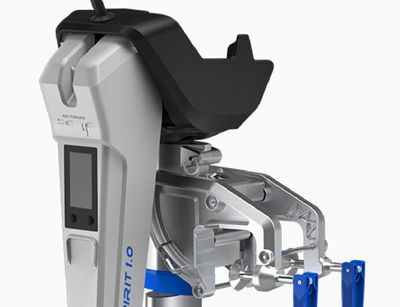 The SPIRIT 1.0 is control by a variable speed control throttle on the end of the steering arm. Giving this motor the ease to steer and change speed using 1 hand only. This 1KW electric outboard, equivalent to 3HP gasoline outboards, is designed for tenders, dinghies and sailboats. 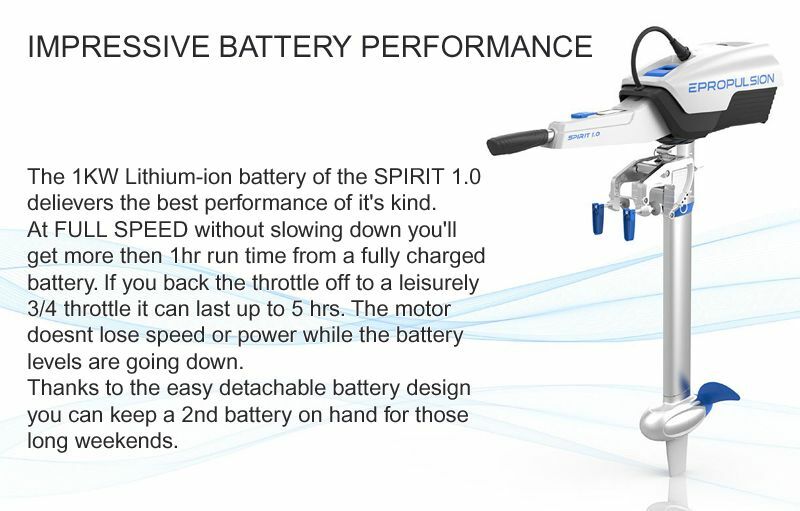 With integrated large capacity Li-po battery, Spirit 1.0 provides super long endurance. Its light weight, detachable battery and foldable tiller design makes it very easy to carry and install. Spirit 1.0 together with integrated large capacity lithium battery only weights 16kg, which makes it very easy to carry and install. Due to the electrical characteristics of Spirit 1.0, it can be very intelligent. 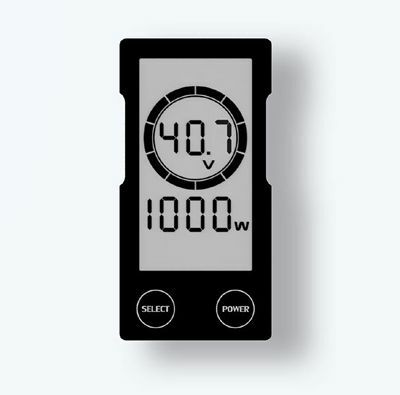 The integrated LCD display provides all the relevant information that you need such as the battery voltage, current power, remaining battery capacity, and remaining run time. There will be even more information in the near future. Spirit 1.0 also meets the IP67 ingress protection standard since all the electrinics are sealed, which can totally dispel your worry. Compared with the complex internal combustion engine, the BLDC (Brushless DC) motor system requires very little maintenance.